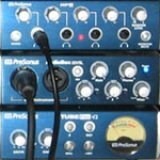 In this video, Justin comprehensibly recommends to plug the preamps only into line inputs, since the preamps' line signal "might be too hot" for mic/instr inputs. I'm running a TubePreV2 with an AudioBox22VSL which has only mic/instr inputs - so far it works fine that way, as long as I operate the input gain very carefully. Is the mentioned "heat"-problem just having to keep the gain knobs down or should I be afraid of any damage beyond this? Keep the gain knobs down and you'll be fine.